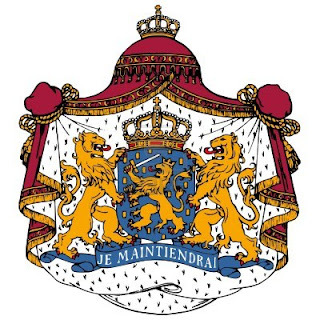 Regular readers of this blog will know that I'm Dutch and living in the country's residence, The Hague (the Netherlands being one of those countries in which the seat of government is not in the capital. The capital, of course, is Amsterdam). These days, all of the Netherlands are preparing for a fairly rare event: the abdication of the present Queen and the inauguration of the new King, this Tuesday (a ceremony which will be held in Amsterdam, by the way). In most of the world's remaining monarchies abdication is very rare but that is a bit less so here. In fact, in the two hundred years this country has been a kingdom, 3 out of the 5 (soon to be 4 out of 6) monarchs have left the job by abdication. What is unusual to all Dutch people alive now, is the fact that, after a century of queens regnant, there will be a king. And a queen consort as an added bonus, obviously. So, after some not-very-thorough consideration, and after seeing shop windows and street decorations slowly turn more and more orange, I decided to fabricate my own little nod towards the orange fever. (although the Dutch flag is red-white-blue, the colour associated with the royal family and the colour which, in itself, is used to represent "Dutch-ness", for example in sporting events, is orange). I think orange is too much of a cliche and it's not a colour I can wear anywhere near my face. 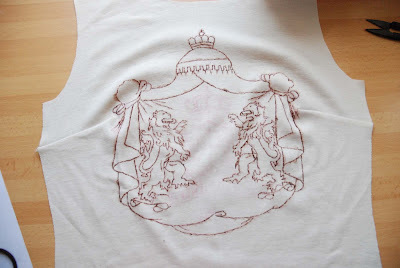 Instead, I decided to use an old idea of mine: a heraldry print t-shirt. 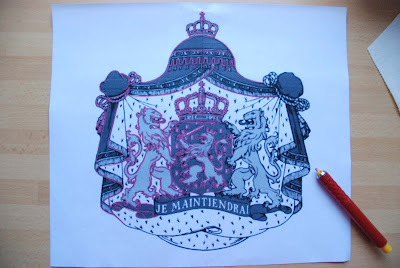 This is the Dutch coat of arms. Very much one of a late date, I think (it is, this royal version came into use in 1815). Loads of flourices and the actual shield making up only a small portion of the whole thing. Also, in some cases, like on the uniforms of national sports teams, only one lion is used, without the sword and bunch of arrows of the one on the shield. I also found an image of the crest without the ermine drapes and top crown, which would have been easier to trace, but I thought the outline of the whole thing would work better on a t-shirt. To create the 'print' I didn't use t-shirt transfer paper. I don't like the plastic-y layer you get with that. I used my cheat's method to trace the whole thing with fabric marker. It's a method I've mentioned on this blog before, but never explained well. The principle is simple: You find a picture to use, either on the internet or by scanning (consider copyright though) and scale it up to the size you want. If your picture has writing in it or is directional in some other way, flip it vertically (I forgot that this time...), then print. Black-and-white is fine. 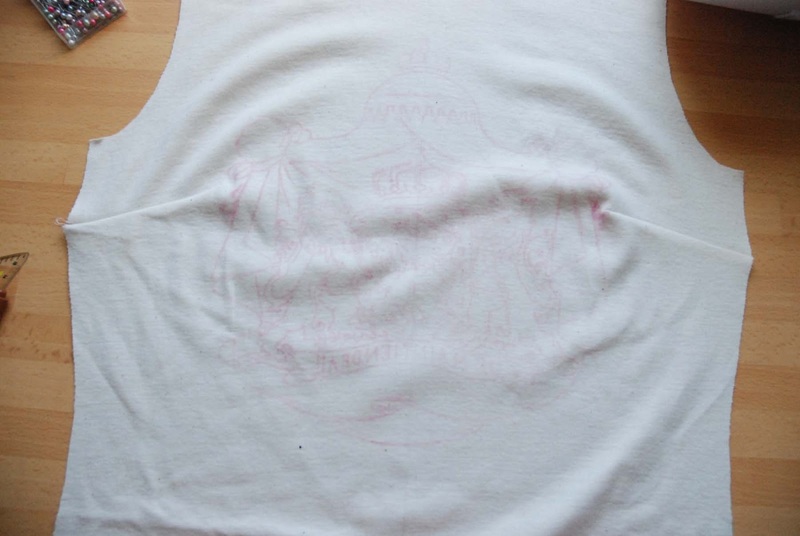 For this t-shirt, I used two A4 prints, printed with a bit of overlap so I could easily stick them back together. Then, trace those elements you want to copy with tailor's chalk. Pick a colour which contrasts both with the print and with your fabric. And be very careful to work from the top down and from left to right (if you're right-handed, that is) to avoid smudging your work. 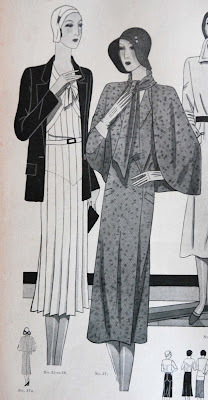 At this stage, I simplified the draping and left out all the spots of the ermine. Now, get out your fabric marker and trace the chalk lines, working from the bottom up and from right to left, so you won't fade out any of the lines. I decided to trace all the symmetrical elements of the coat of arms now and leave the writing and the directional shield for later. 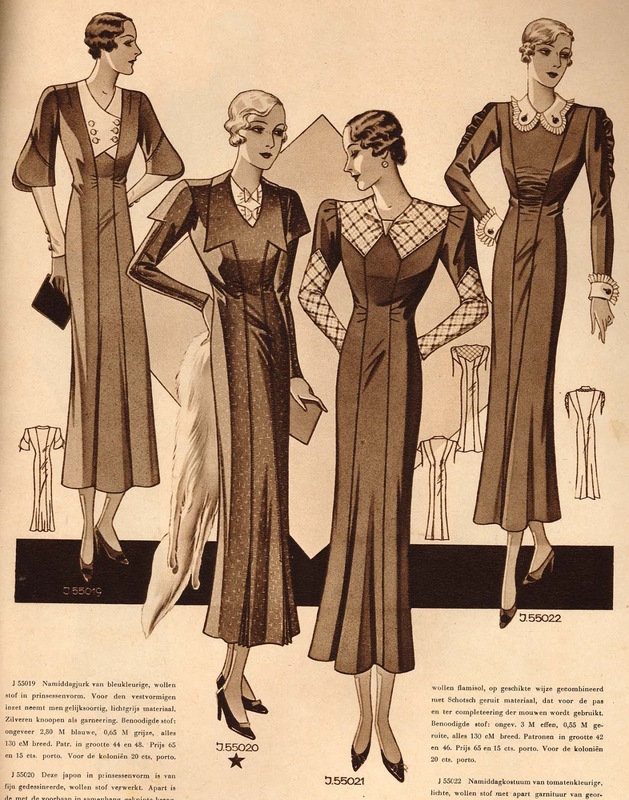 In stretchy knits, it is impossible to get perfectly clean and smooth lines, so you have to work carefully. This blouse has finally been sewn up! The pattern sheet of this particular issue of Gracieuse magazine, which was published when my grandparents were toddlers, doesn't show the marks of a tracing wheel. 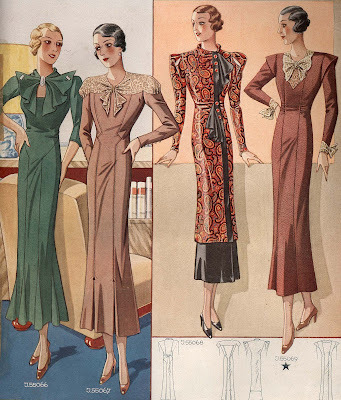 So, I can only conclude that none of these patterns were ever traced, none of its lovely designs turned into garments. Until now, that is. May I present to you design no. 22 from Gracieuse no. 1 of 1930 (which was the 68th year of publication of this magazine). 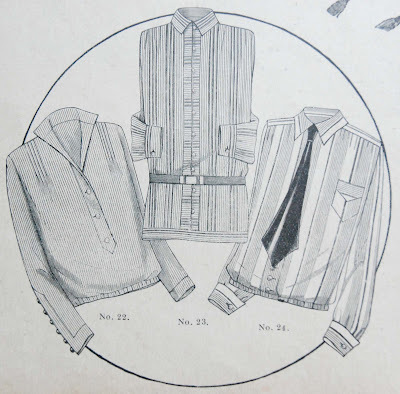 It's a blouse which should be worn over the waistband of one's skirt and the pattern was for size 42 (= for those with a halved bust circumference of 42). I'm pretty pleased with the fit. Based on the look of the back pattern piece, I was worried about the angle of the shoulders and the width of the neck, but, as it turns out, the shoulder seam is placed more to the back than I'm used to. And it sort of angles down a bit further yet at the outer edge, just like in victorian jackets. 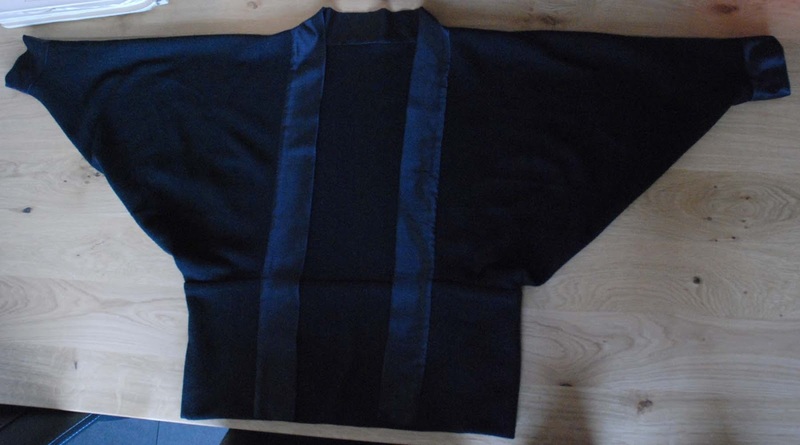 The back width is about right too, and so are the length and width of the sleeves. They even provide a proper range of movement. The loose shape makes it hard to judge the torso. Yes, there are some very minor drag lines from the front pintucks to the apex of my bust, but I think that my just be a result of this particular form of shaping, rather than an indicator of size... I guess I should just pick a more fitted design to find out about that. 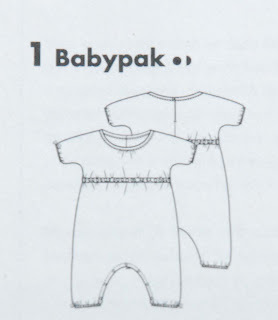 I made everything the way I thought one was supposed to, except for one thing: You are even told in the instructions (which are very limited) to put elastic in the entire bottom edge of the garment. I did that, and didn't like the look at all. I ended up putting it only in the back. This gives me a full, bloused back and a more smooth and fitted front. It may not be period acurate at all, but this minor alteration has turned an 83-year-old design into something I can easily wear without looking costume-y (your costume-y may vary... I am aware of being quite tolerant of unusual looks). Nevertheless, I've made some detail shots, so I could tell you about some of the more unusual and tricky features of this garment. First up, there's the front closure. Button tabs on the outside. Not standard, in wovens today, but not that unusual either. But they're facings on the inside... I have never seen this before. 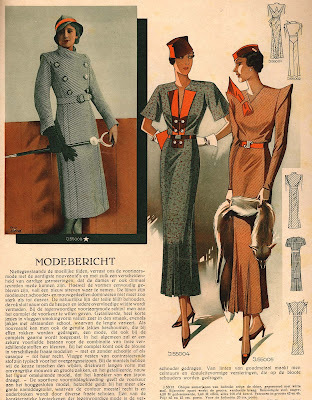 It wasn't hard to understand how the pattern pieces were supposed to work but sewing it together neatly was a bit more complicated. I understand why it was made this way: It's the perfect finish with the open collar. The most difficult bit of construction were the cuffs. They are quite nice: Like facings on the outside, with button tabs which lead up to the elbow dart. The problem is this: they go over the underarm seam, so that has to be sewn first. 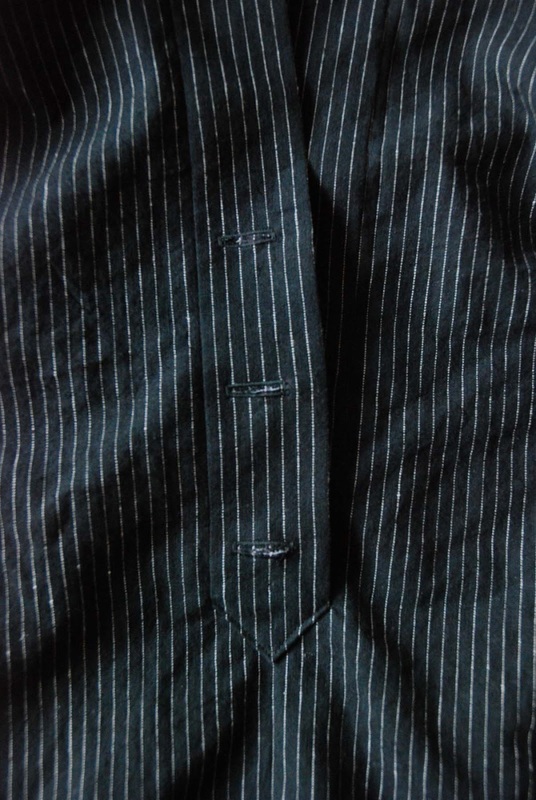 This leaves you with just a tiny space for the tricky manipulations with the dart, the top of the button tab and the little extra facing you have to add at the other side of the slit for the buttons. Also, the instructions tell you that bit should be 2 cm wide (which is what I made it) but in the illustration it looks about as wide as the outside tab, which is almost 4 cm. The narrowness of the sleeves and the necessary order of cuff construction are the reasons why I only put one button on each sleeve. I don't think I could have convinced my sewing machine's buttonhole programme to work in such a confined space. 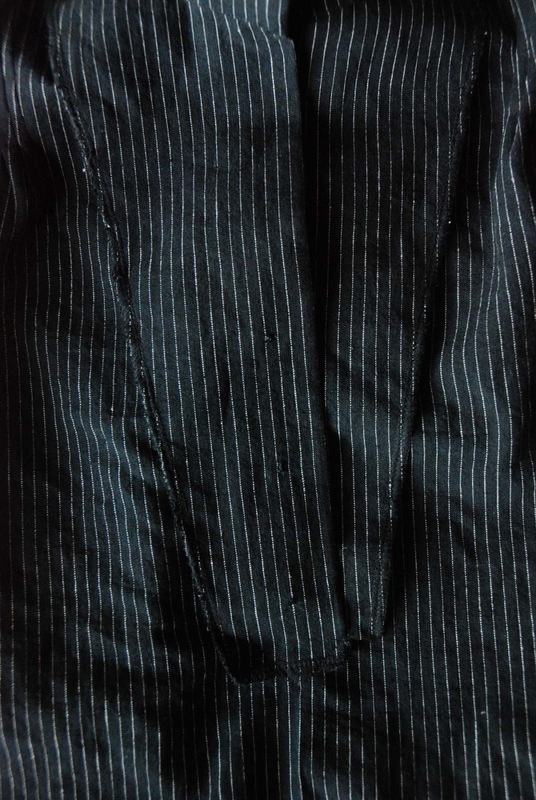 About those buttonholes, and any serged edges you may have noticed, I didn't even try to go for period finishes here. I respect anyone who does, but to be honest, I don't even know what the period acurate way of doing any of this would be. And I was only trying out the sizing. 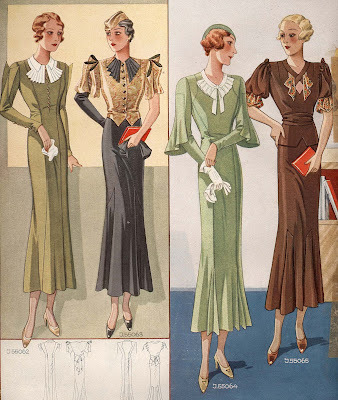 And, like any vintage (inspired) garment I make, this blouse wasn't made to be worn to a period dress event but for my everyday 21th century life. 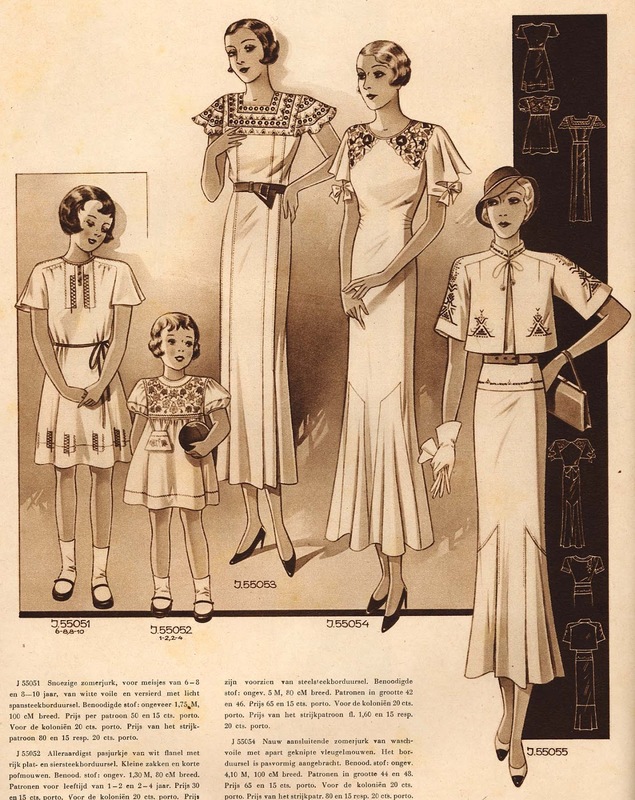 To review my first experience with a Gracieuse pattern: sewing a garment from this magazine is not something even an experienced seamstress should take lightly. 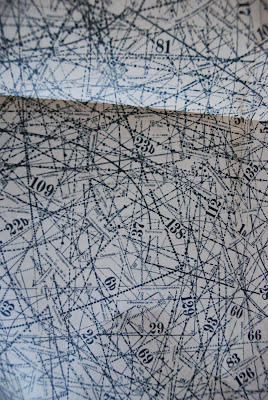 Even tracing the pattern takes time, patience, good light and up-to-date glasses. There are unusual design and construction details and the instructions, if any are provided, are very sketchy. Figuring those out is certainly not impossible but a wide range of sewing experience and some improvisation skills come in very handy. And patience, of course. I haven't just been looking at those splendid designs from the 1930's. This week, I've started on my first Gracieuse project. Like all other Dutch (and French and German) vintage sewing magazines I've ever come across, all the patterns included in the Gracieuse are in one size only. As is usually the case, there is something in each of the magazine's regular sizes in every issue. Gracieuse sizes have no relation to any modern sizing system. They do, however, relate directly to the sizing chart. Your size is half your chest measurement. My chest measurement is 87 cm, which puts me right between the sizes 42 and 45. Because I found such unexpected amounts of ease in the vintage patterns I tried before, I decided to start out with the smaller size. I picked a blouse as my first pattern. This should give me some insight into the amount of ease used, the back length (the sizing chart mentions only a front waist length but doesn't explain how to measure it) the shoulder width and shape, the ease (or lack of it) at neckline and armscye and the length and width of the sleeves. It's the one on the left. Cute collar and button band, something which looks like pintuck shaping, elasticated bottom edge and slim sleeves with buttoned plackets. There were two different markings used within this five piece pattern. 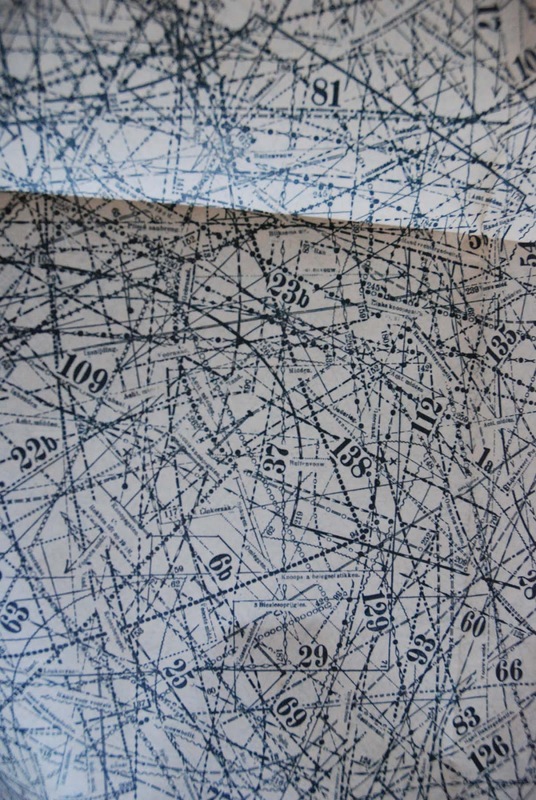 All pattern pieces were intersected by others with only very subtely different markings. And both bodice pieces had to be lengthened. The blouse in the illustration seems to be made from a finely pinstriped fabric, so I cut mine from my only stash fabric with thin stripes: this black linen with narrowly space white pinstripes. This was another bargain fabric, so I just cut out the pattern I had traced and didn't bother with making a muslin. 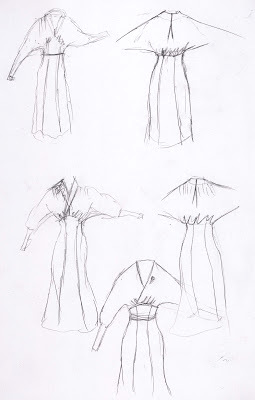 I sort of winged it, I used the prescribed width of the pintucks and the area appointed for them in the pattern and sort of cross-referenced that with the difference between the front and back shoulder and the neckline and collar and compared that to the illustrations. I quickly decided not to look at the illustrations anymore. As lovely as they are, their information didn't add up with what measuring the pattern pieces told me... And oh, if the center front is to be cut on the fold and both the front shoulder and the area marked out for pintucks are at an angle, there's just no way those tucks are going to line up with the stripes, is there? My sister's baby boy was born last Thursday. Mother and child are doing fine and are being well looked after, both by a nurse (here in the Netherlands, specialized nurses come to care for new mothers and their babies at their own homes for the first week after the birth. I have no idea if this is specifically a Dutch thing or common in other countries as well) and by the proud new father. As the sewing sibling, I obviously had to make another item for my nephew. I picked this Knippie April/May jumpsuit. I made size 68 and altered it a bit to make it more suitable for a boy. Maybe it's just me, but I thought the neckline gathers and the elasticated waist would make it a bit girly. 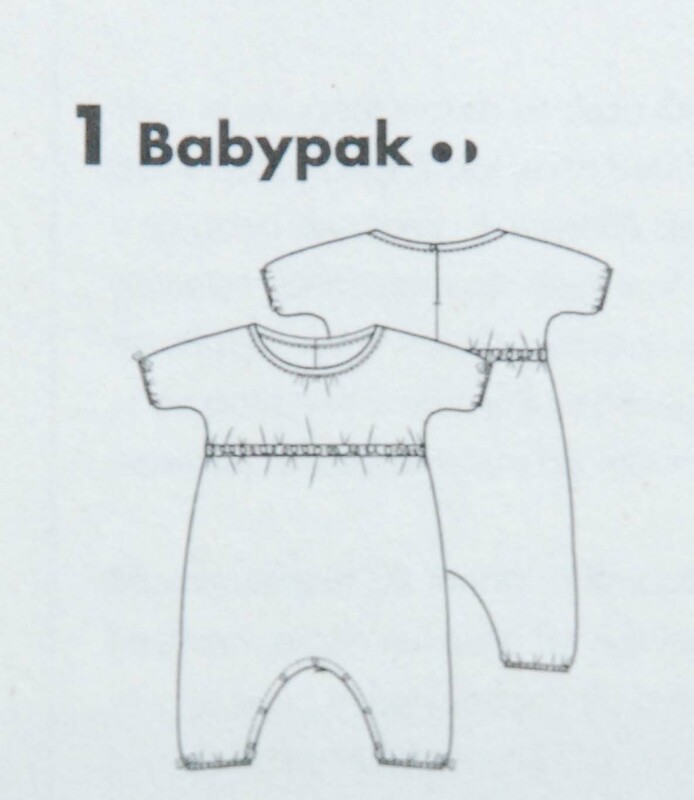 This jumpsuit has a feature which I think will be very useful in a garment for a baby: a snap closure along the entire inner leg seam. 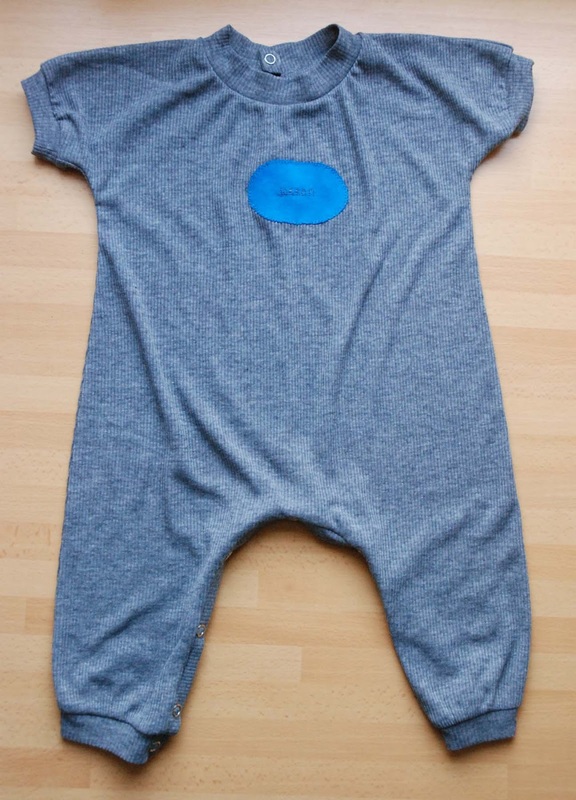 I made the jumpsuit in a lightweight grey rib knit, with a bright blue patch on the chest with the baby's name on it (done in the embroidery letters my sewing machine can do. It's not that easy to read, but I hope the mum and dad will like this little personal touch anyway). 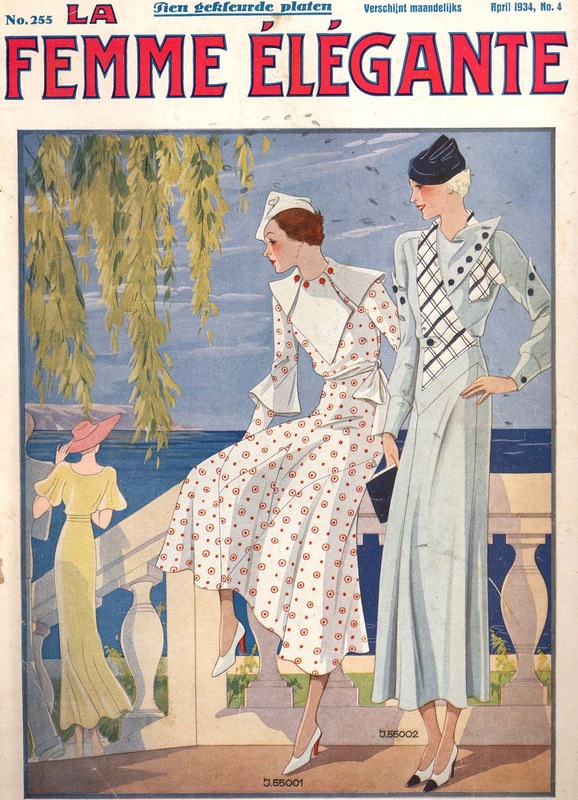 Last week, I've been studying my Gracieuse magazines from 1930 (I thought I should work my way through the pile chronologically, but the early '30's ones were just calling out to me. 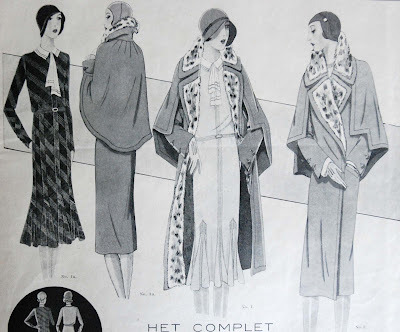 And they were easy to reach because I now have to piles on the shelf: 1920 to 1930 and 1930 to end of Gracieuse with pattern sheets). 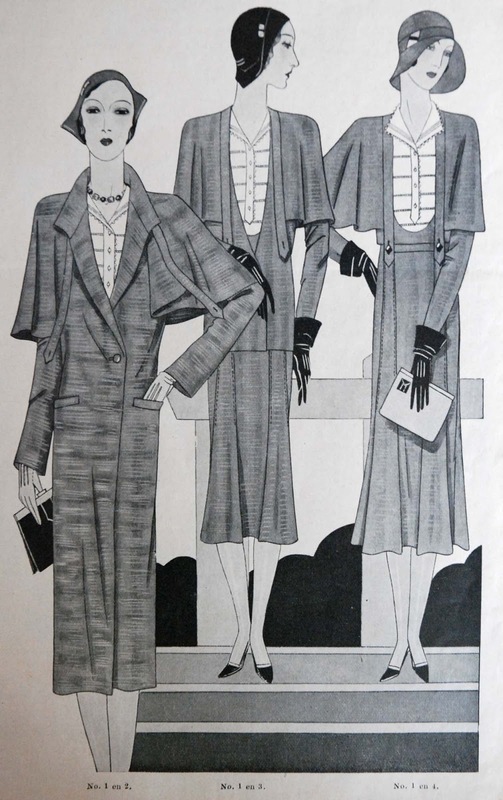 Judging from this this publication, 1930 was a great year for fashion. The trends of the day show a transition from the loose but intricately decorated styles of the 1920's to the sharp silhouette of the 1930's. 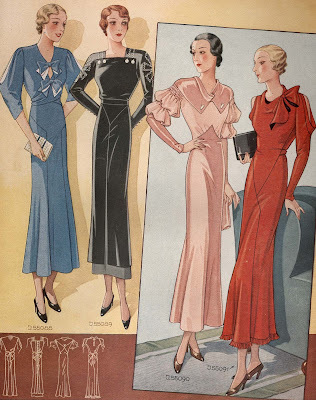 Waistlines are back to the natural waistline or just below it and are carefully being shown again, skirts are getting longer but often have uneven hemlines in interesting shapes, (pin)tucks and biais cut sections are used both for decoration and to give shape. One thing especially caught my eye. It's mostly, but certainly not exclusively, using in coats: the pelerine. These little capes feature on at least half of the coats printed in the issues I have (throughout the year, not just in winter) and are regularly included in dress designs as well. 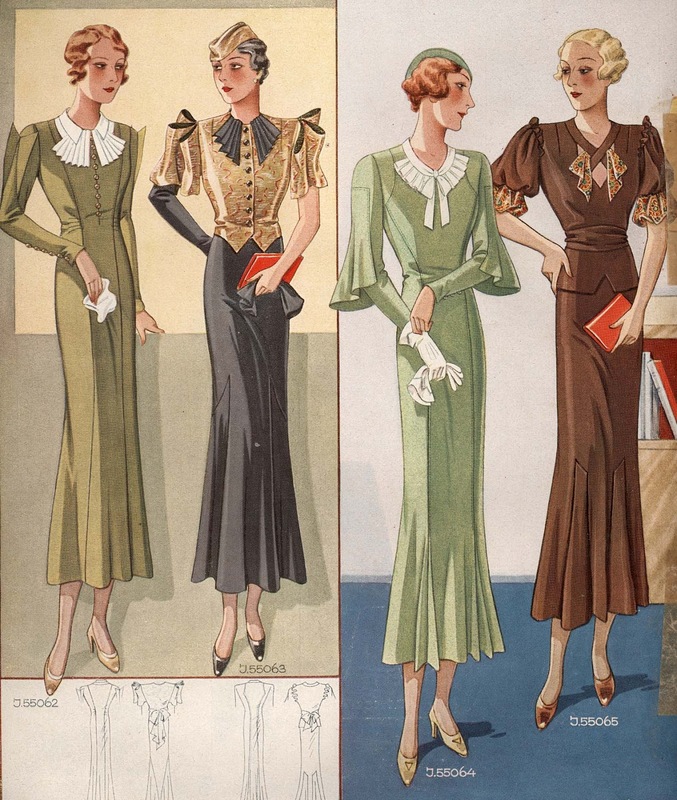 I think the summer dresses in which the pelerine works as both collar and short sleeve are a particularly nice option. Like all coats from 1930, the ones with pelerines are fairly straight in line with long lapels (which can often be worn closed as well) and high upper collars. The closure is at or just below the waistline and most used style is single breasted with a large overlap which places the button past center front. Pelerines can be seperate items, in which case they may be used over a dress as well, as part of a 'complet'. or hang from a shoulder yoke (this is actually a dress). There are even some which exist only on the back of the coat. I guess one would attach those to the shoulder seam an to the sleeve. but it's also not unusual to have them attach to a narrow center back panel (the coat on the right, which is seen on the back. 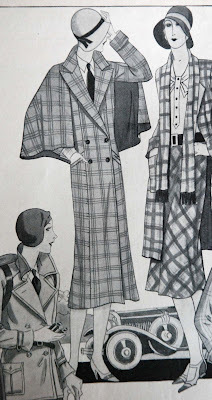 I also love the black coat which does come with a, two sizes too large for me, pattern). If the design is meant for stripes or checks, this panel is usually cut in a different direction from the body of the coat. Also, pelerines can be cut as one piece, or with seperate front and back pieces. 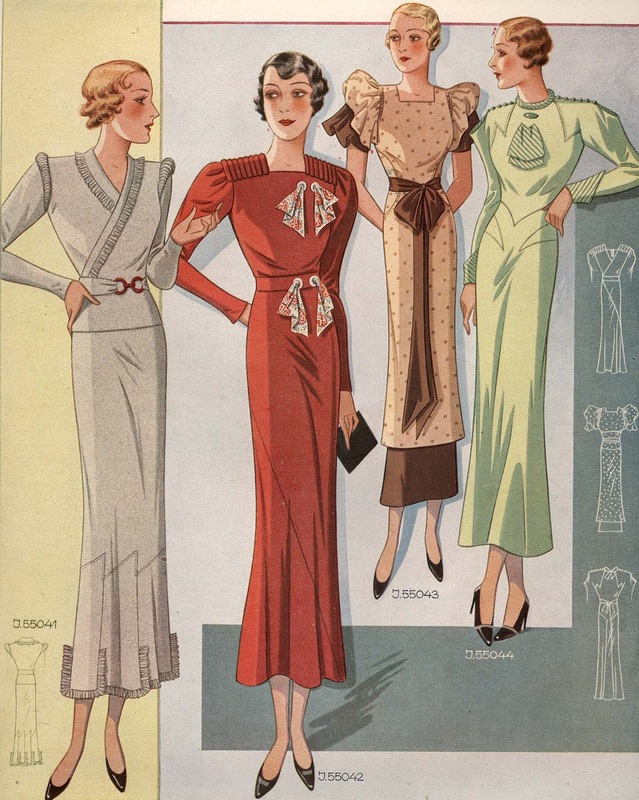 If with seperate pieces, there's usually no shoulder shaping, these things are meant to be wide. It's a light coat fabric and at 4 meters, it should be enough. I originally drafted the pattern for the dark grey velvet. But, obviously, with velvet, you have to consider the nap, which meant I didn't have anywhere near enough of it for this design. I did like it though and I thought it would work as well in a fairly drapey knit, so I bought this blue/grey/purple viscose lycra (the choice of colour was rather limited because I needed the fabric to have a particular weight and hand). It's based on these recent sketches but the very first appearance of the idea of it was way back in 2010. The dress has a skirt with six gores which flares out at about 15 cm above the knee. It's a bit longer at the back. 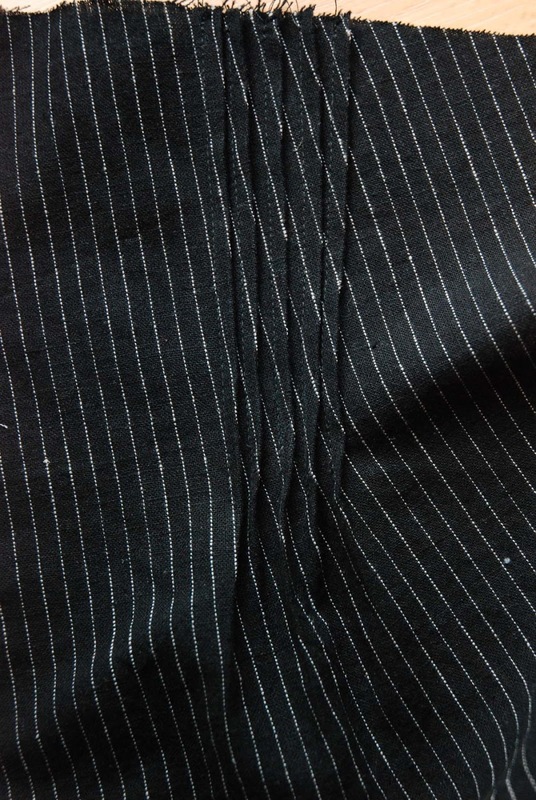 The 'waist' seam sits just below the bust at center front and dips to just above the waist at center back. The wide, kimono-sleeved bodice is gathered on. 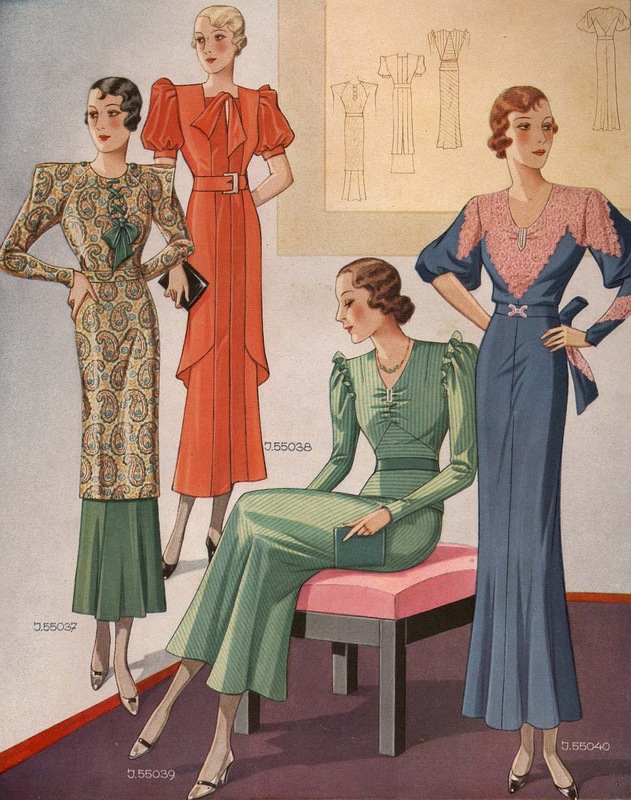 There's generous blousing at side and back because of the fitted, sleeveless, lycra under-bodice which is attached to the outside only at the waistseam and along the neckline. 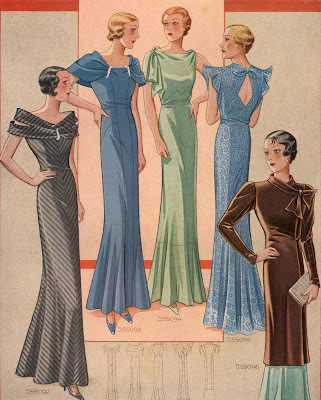 A slight surplice front gives a deep V neckline. But the coupon-people are back! I know most of you live far away but if you happen to be within easy travel distance of the The Hague market, this may be of interest. I've met these sellers before a couple of years ago. They sell cut pieces of fabric from anywhere between 2 and 10 meters long at 1 euro a meter. Just dig through the pile and grab what you like, they won't cut large pieces but they measure quite generously. These fabrics were samples sent to workshops for previous collections. Many of them are of very nice quality. When these people were at the market before, I bought lots of wool fabric. Now, they seemed to have brought a different selection. When they were there before, they kept coming back for a couple of weeks, presumably until they'd run out of fabric. - 2 m of grey jersey, I think the label said 'Tencel', which would explain why this fabric is so soft and smooth to the touch. 3 m of charcoal grey ponti di roma. I haven't sewn with this stuff a lot but I don't think I have to explain why I thought I had to buy it. 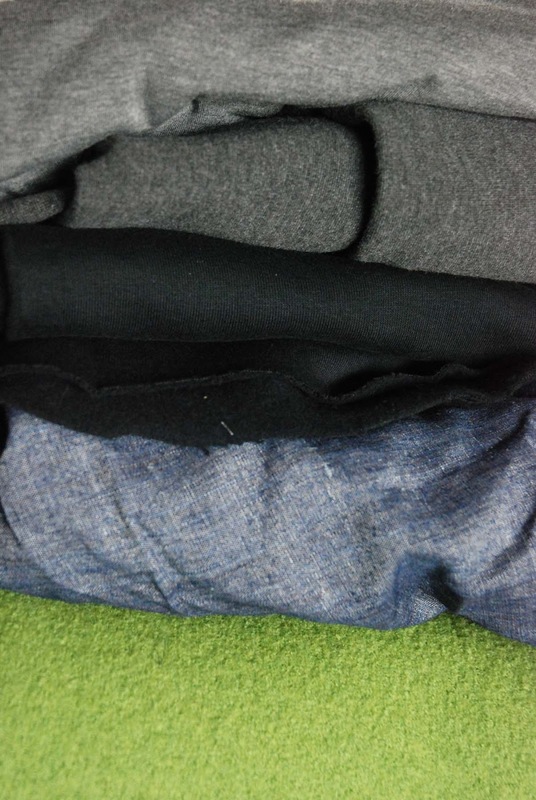 - 2 m of black cotton sweatshirt fabric with a wonderfully soft plush back. 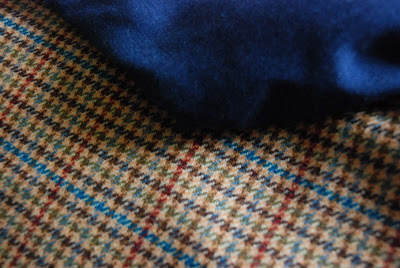 The first piece of fabric I picked up, just perfect for cozy and casual winter wear. - 7 m of jeans coloured, sturdy, plainweave fabric, I think it's linen or a cotton/linen mix. 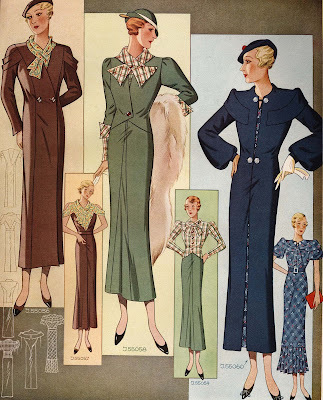 Anyway, great for summer trousers and maybe some kind of 1950's workwear dress. - 3 m of knit boiled wool in a great bright green. I just loved the colour. This type of material was really popular one or two years ago, so I think that's why it was there. 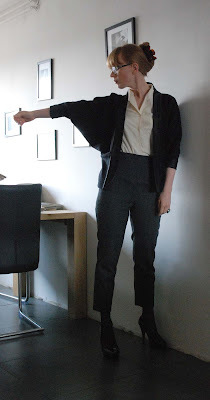 It's great for unlined cardigan/coat type things (and quite a bit thicker than the stuff I just used for the cardigan in Sunday's post) so I think it would be nice for some sort of intermediate weather cover-up. For years, I've been happy not to follow the low-rise skinny jeans trend. 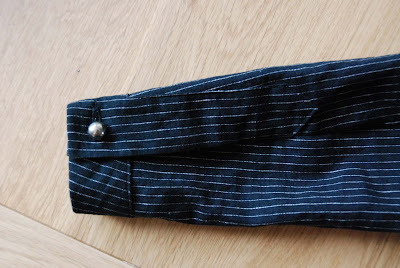 My earliest self-drafted trousers (as in pre-dating the blog early) all had either a boot-cut or even a mild 70's style flare. 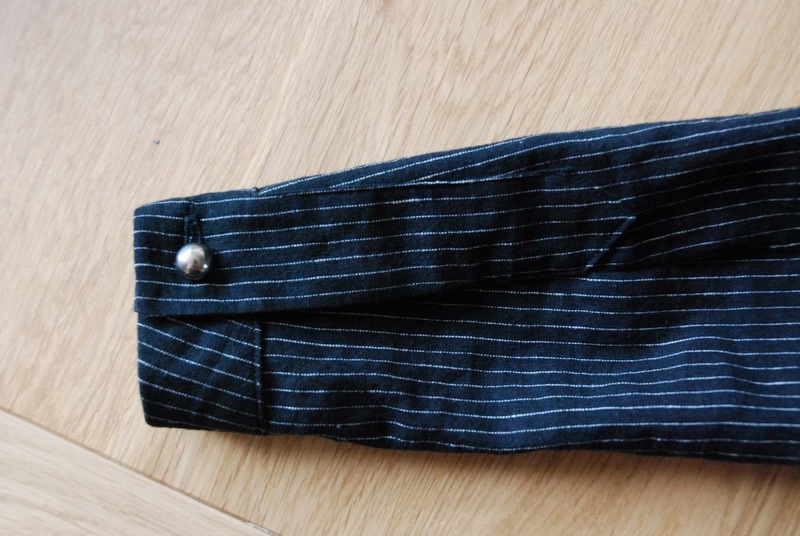 Although I changed the shape of each new pair, including a venture into even roomier styles, nothing major happened until I tried tapered belt pleated trousers back in December 2009. I still have and wear that particular pair and I have come to like it so much I keep telling myself to make another one. That was the first time I tried a radically different silhouette. 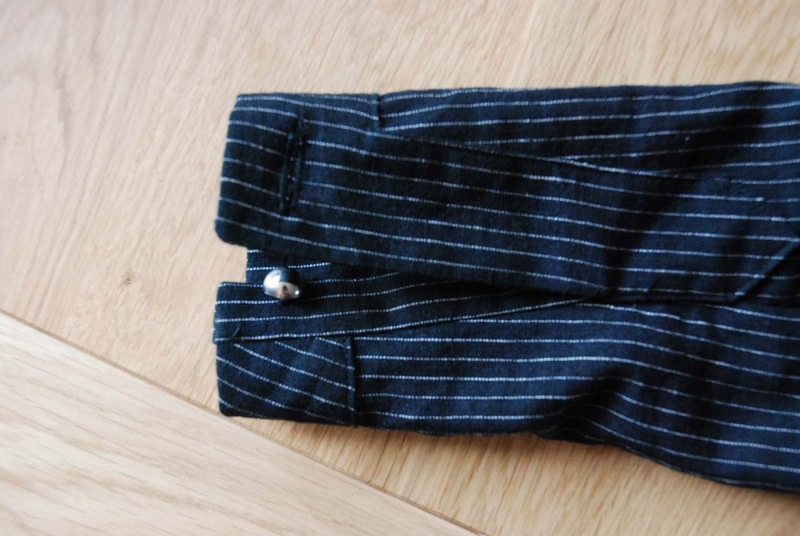 Then, in January last year I made my first pair of high waisted, fitted trousers. Like the belt pleated ones, those were hemmed at ankle length. I know a lot of people hate that trend but I find it lends a touch of lightness to the whole look. By now, I think I have just about any trouser shape imaginable in my wardrobe (leg-wise that is, there is nowhere near as much variation in rise. And I still exclude RTW's best-seller, the true 'skinny' which relies on huge amounts of lycra for its close fit. Oh, and I don't count leggings or anything derived from them as trousers). 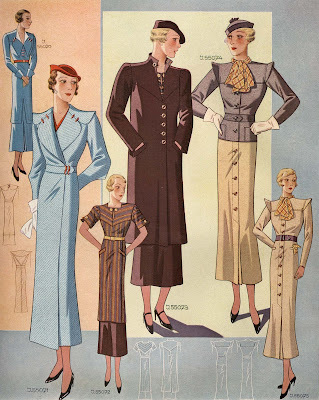 I like the variety and I've found that each style has its strengths and weaknesses when it comes to making outfits. For example, I've found that I prefer to wear my jackets with narrow trousers (hemmed at ankle length). In that combination, they don't look quite so serious or over-dressed. This winter, I was reaching for the belt pleated and narrow styles way more than for the boot-cut ones. Even though I only have a rather limited number of tops which work with them. Time to change that. Narrow bottoms tend to require a bit more room on top but I don't want my upper body to be swamped either. This is the first new thing I've made especially to go with my narrow legged trouser styles. It is still a bit of a winter-y, but I plan on making a couple of roomier t-shirt type things as well. I started out with the basic shape (a rectangle with the corners folded in) as the one I used for this cardigan. I've always liked that one, but the fabric is a bit too synthetic for my taste. And I wanted something a bit longer this time. Its tutorial is here. 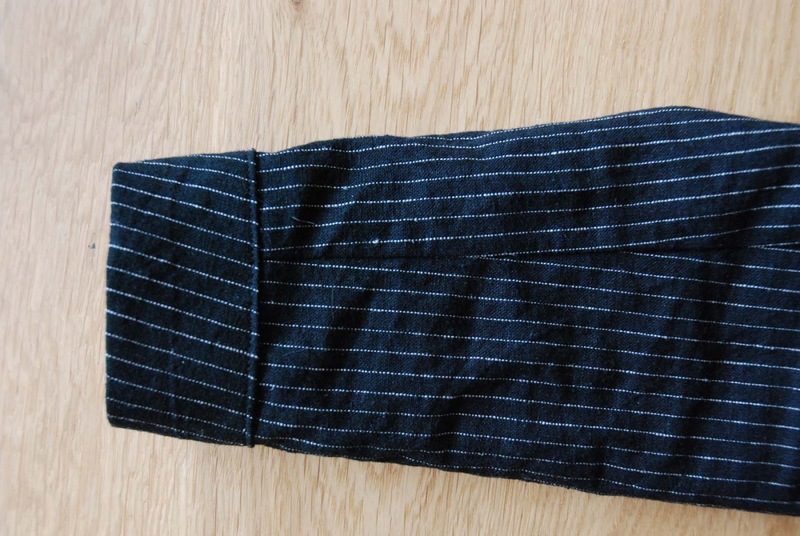 For this version, I cut away a curved section at the bottom and made a double, 20 cm long band to attach to it, creating the waist-to-hip section. 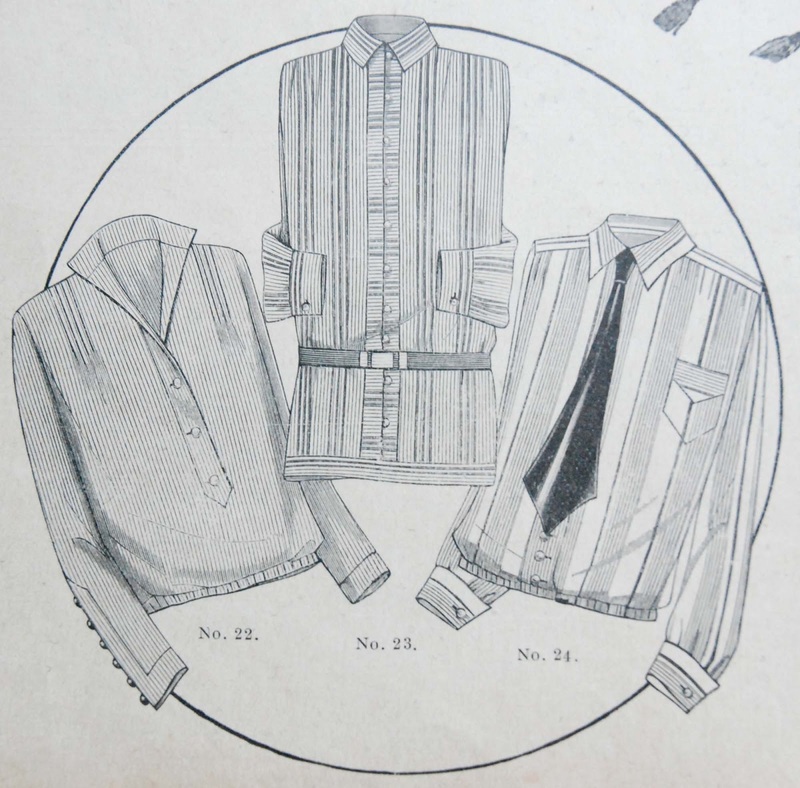 These pieces were cut in a woven boiled wool (which is thin for boiled wool). I made the front edge/collar and the cuffs from a rather stable black silk. When worn, this cardigan is all roomy shapes and angles but flat on the table it shows it's true 'mostly rectangles' spirit. According to the calender, it is well and truly spring. However, here in the Netherlands, it doesn't feel like spring yet... I have to say it is slightly holding me back in my sewing plans: it feels a bit odd to sew wool trousers in April but with the cold wind (and even some snowflakes earlier today!) nice light cotton dresses are not yet on my menu either. While I ponder the issue, I thought I'd share some nice pictures from one of my vintage magazines with you. 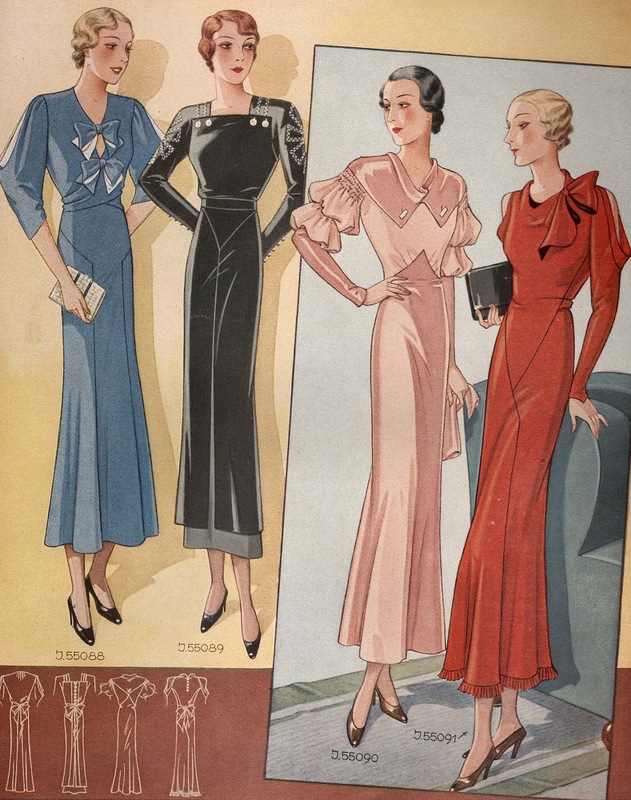 These come from La Femme Elegante from April 1934 (a magazine from my big haul back in February. This one is unfortunately without its pattern sheet). I'm showing you all the colour pictures and some of the black and white ones.